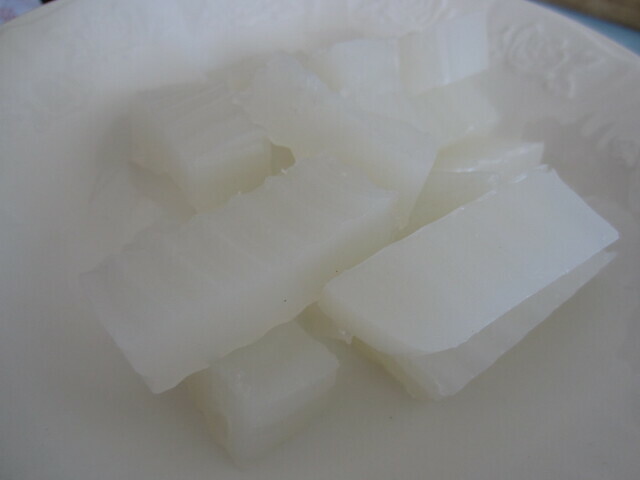 Korean jello isn't sweet like most western dessert varieties. But yowsers, does it ever make for a silky smooth and healthy side dish to steaming bowls of rice and soup. 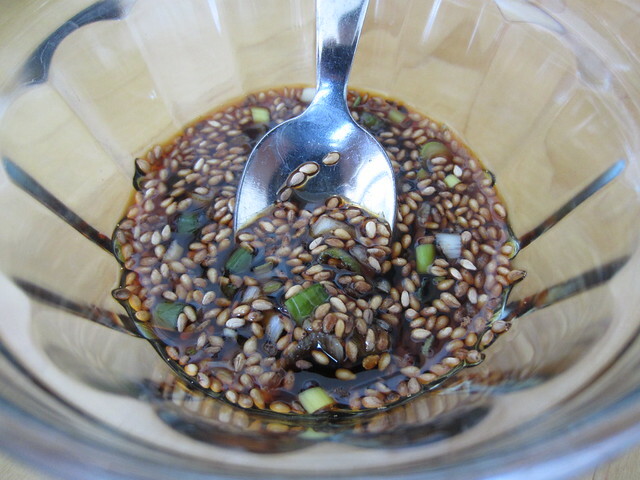 To fully appreciate Korean jello, you have to drizzle on a blend of soy sauce, sesame oil, sesame seeds, and green onions. 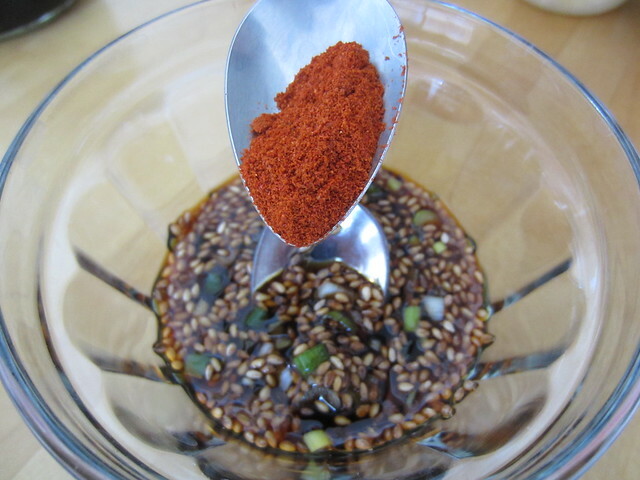 Add a pinch of chilli powder to the mix and you may just have a new favourite dish for family and friends. Called doh toh ree mook in Korean, these lovely jello squares can be made with a few different primary ingredients, the healthiest of which are acorn powder and green bean powder - both are readily available in Korean grocery stores. No need to add gelatin - if you follow the instructions below, it will come out just like jello without sugar. 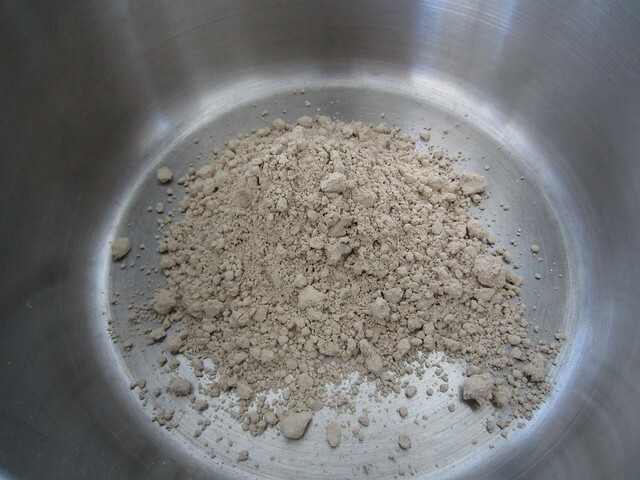 Green bean powder or starch will produce a white, almost frosted or slightly translucent jello. 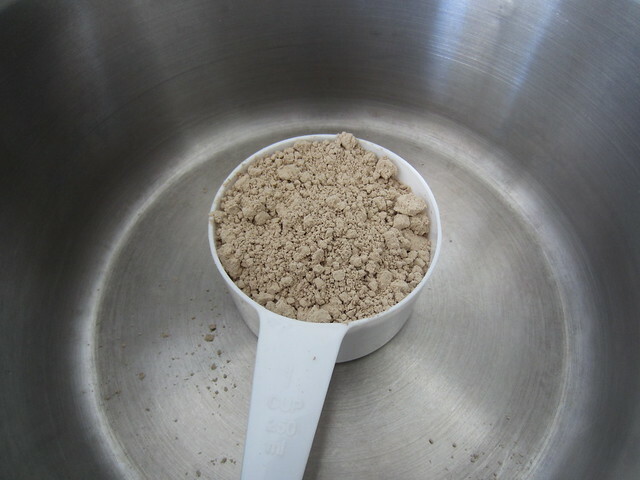 Acorn powder will yield more of an earthy brown jello - not quite as pretty as the green bean variety, but the acorn version is slightly more bold in flavour. 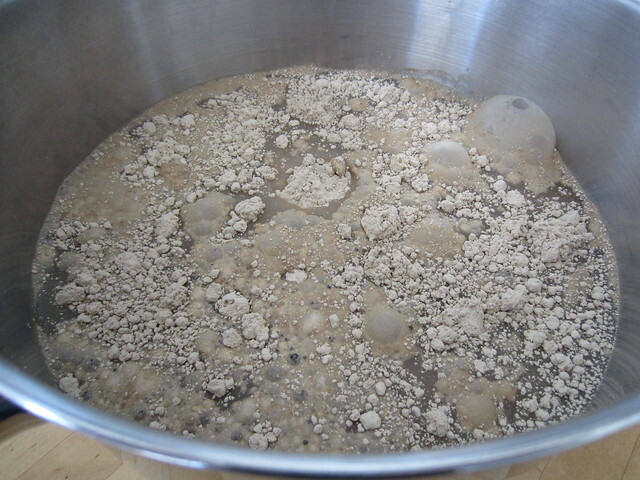 Start by measuring out one cup of acorn powder and combining with five cups of water in a relatively large saucepan or pot. 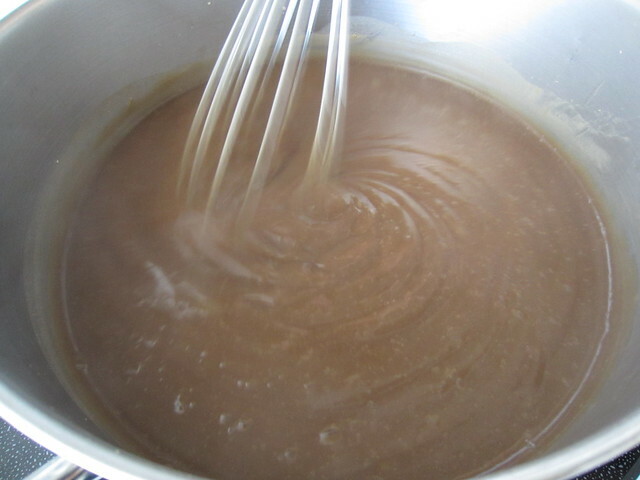 Place over medium heat and stir steadily with a whisk to prevent the acorn from burning. 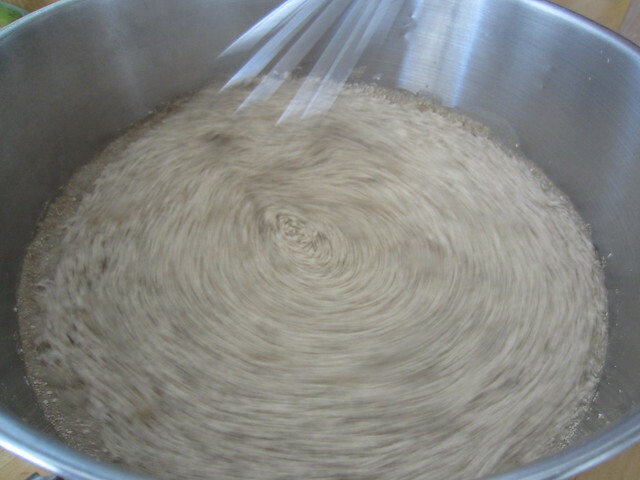 Stir constantly for about 15 minutes, or until you have a thick texture. 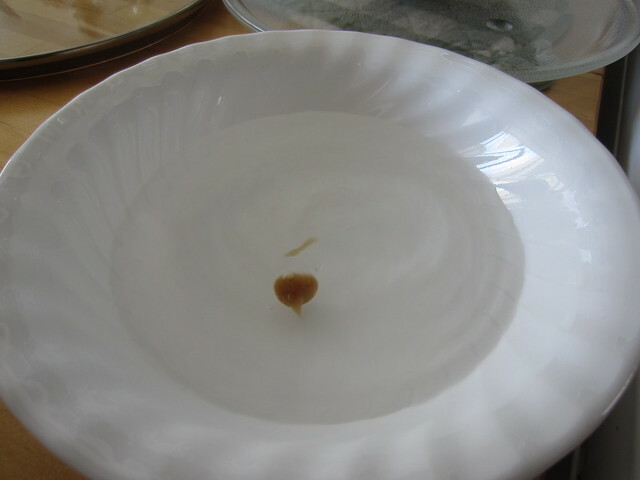 To test for the right texture, allow a drop of the acorn blend to fall into a bowl of water - if it floats, it's time to transfer to a pan for cooling. 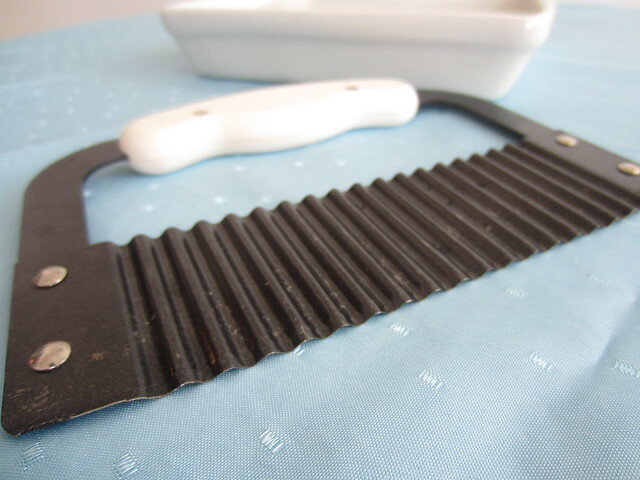 You want to use a pan or casserole dish that will serve as a mould that will allow you to produce blocks of jello that are easily sliced into edible squares. 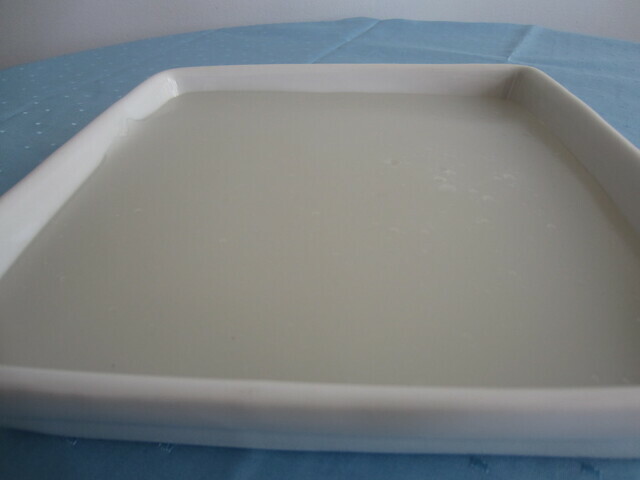 After your jello has cooled down to room temperature, transfer to the refrigerator, where it will fully set to jello-like consistency - this takes about two hours, give or take a bit. 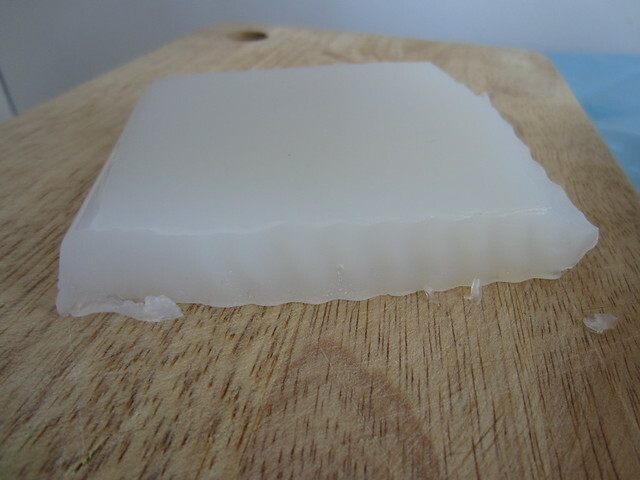 I didn't have time to wait for the acorn jello to fully set to take pictures, but was able to snap a few photos with some green bean jello, which we made with the exact same steps. 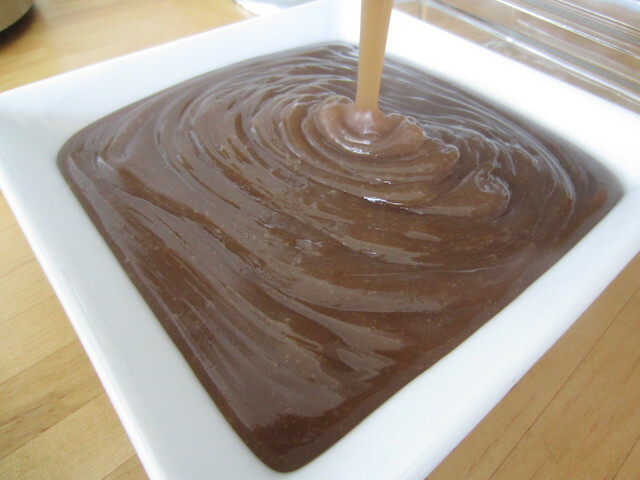 Give it all a good whisk and drizzle over your jello squares. 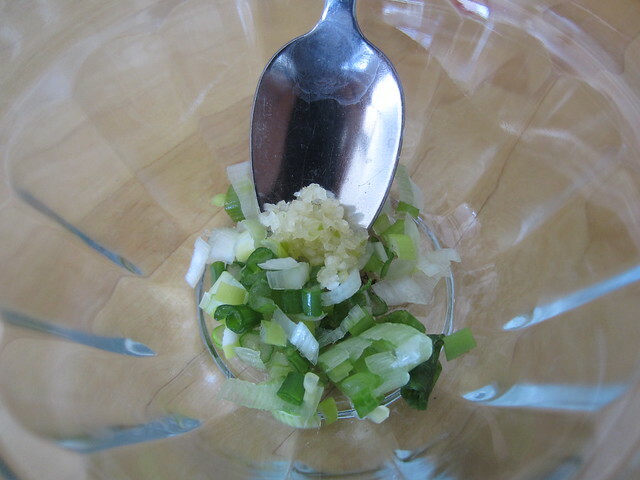 And there you have it, a light yet highly satisfying jello side dish that tends to be a hit with all age groups. If you have questions about this recipe, please feel free to use the comments section below. Hope you have a chance to try and enjoy. 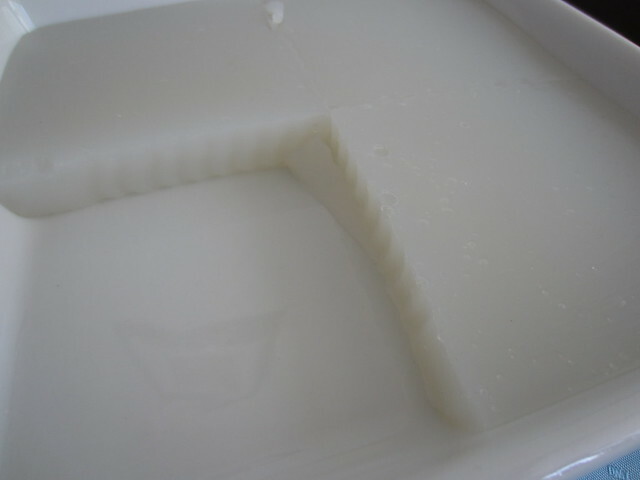 Please note: Korean restaurants that serve this type of jello as a side dish typically use a less expensive powder to create the jello, usually a radish-based powder. To give you an idea of cost, the less expensive radish-type powder is about $1.99 per package, the green bean powder is about $5.99 per package, while the acorn powder typically costs around $7.99 per package. Of course, if you live in Los Angeles or Korea, cut these prices in half. :) Ultimately, it's the sauce that determines the flavour of this dish - all three types of powder produce the same basic jello, so you might want to give all of them a try initially to determine which variety you like best. I'm interested in making this recipe, the sauce sounds wonderful. 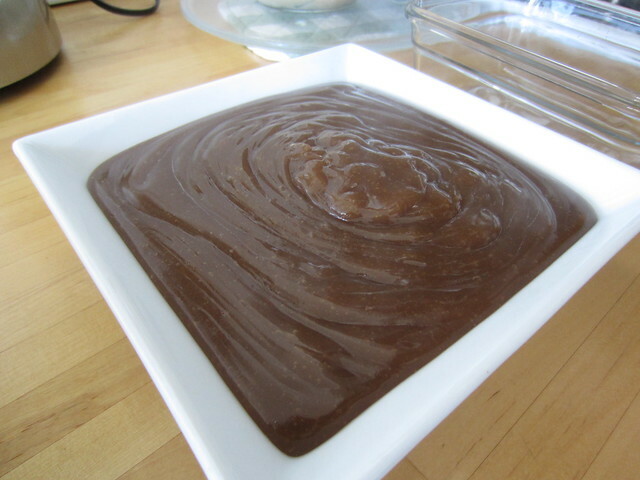 Can I use gelatin instead of acorn or green bean powder? 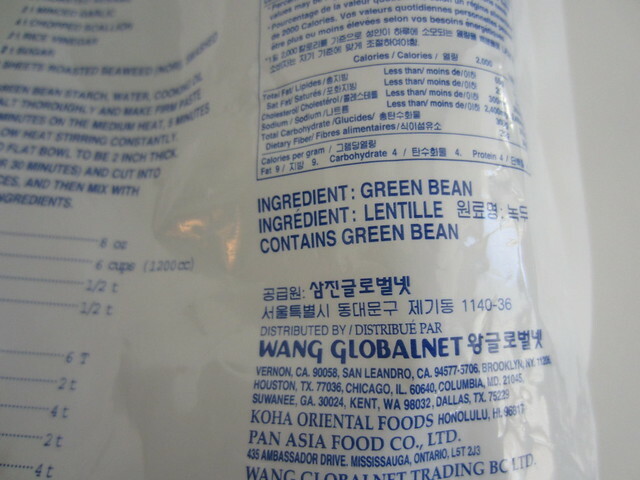 Do you have any information about the nutritional content of the green bean powder or the acorn powder? 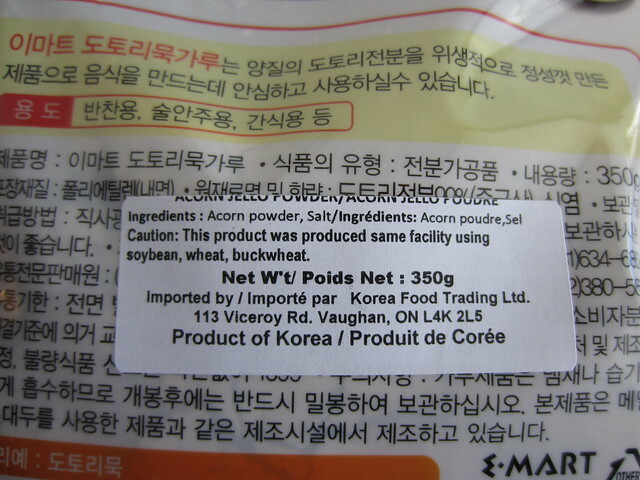 I'm wondering if the green bean powder is pure starch and if the acorn powder contains similar nutrients to nuts. I have never tried this before. I like the consistency of jello, but do not care for the sweetness and artificial colors and flavors... so I don't eat it. This.. I am going to try for sure.. it sounds delicious!!! Looking forward to trying this jello soon. I love Korean food. Sounds like a very healthy nutritious meal. Thanks for the recipe. I think you asked for this information in your email to post in the comment section or on Facebook so this is what I am looking forward to in the next few days. I am looking forward to spending quality time with my 7 year old and 13 year old grandsons. I can never have enough time with my family. I can hardly wait to give a gift to my daughter-It is due to come in the mail any day now. It is a beautiful Lia Sophia bracelet!!! Wow, I'm looking forward to trying this! This weekend I'll be visiting my granddaughter and sitting with a wonderful hospice patient. Thank you for all your informative articles. I am looking forward to seeing my two grand children in London tomorrow ...???? 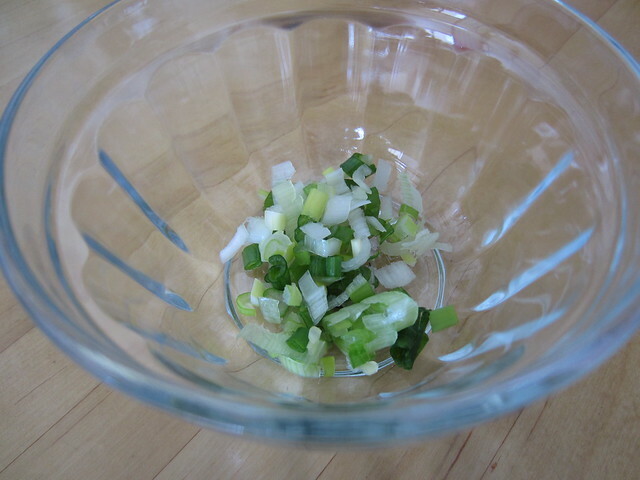 what I am looking forward to is...........making and eating Korean jello with the green bean powder that I win! It sounds delicious! This looks delicious. 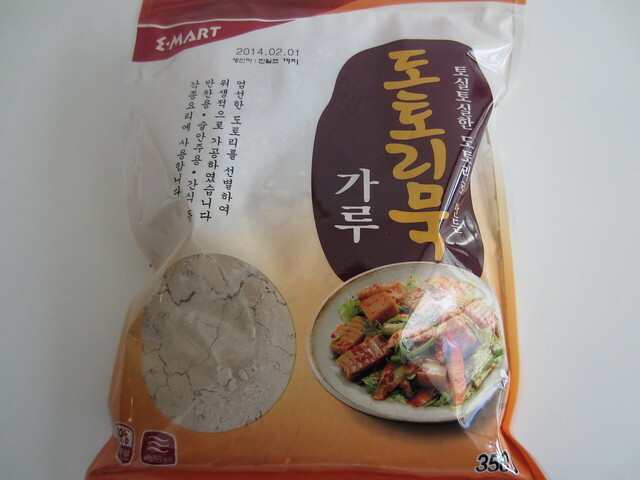 I live in LA so will find a Korean grocery this week and try the recipe. Thanks, Dr. Kim! I love your website and love to receive your email updates! sounds interesting. I would like to try it sometime. 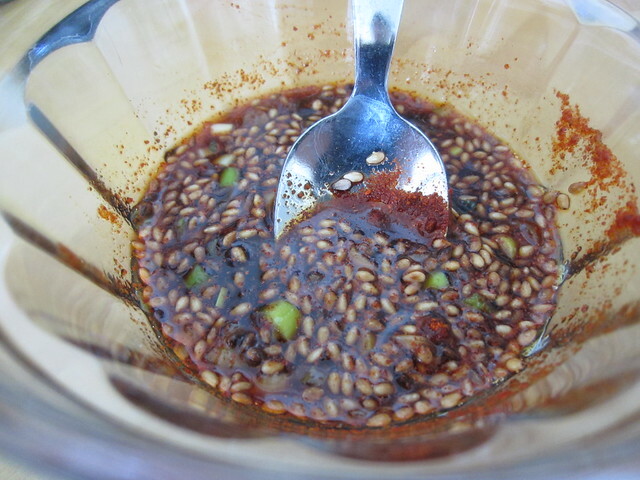 I do see why the sauce would really make the dish; I've been trying out new ingredients to increase the nutrition in our meals, and the ones you mentioned would certainly add a lot of flavor! I'm looking forward to getting my Christmas tree this week. I love the smell it adds to the house and all the preparations as we dive into the spirit of Christmas. having popcorn, pizzelle and oolong formosa tea (my favorite) and good quality family time! It's our catch up night. Boca Raton, FL. This looks delicious. I'm looking forward to trying it. I'm also looking forward to taking a walk in the park tonight. Sounds very interesting. Looking forward to trying it soon. Would like to know the carb count for a single serving since I am watching my blood sugar. I'm in Los Angeles. Hi, I'm Karen from Edenton, NC. One thing that I am really looking forward to in the next few days, is receiving my new inversion table. I have been wanting one for my back health for a long time! 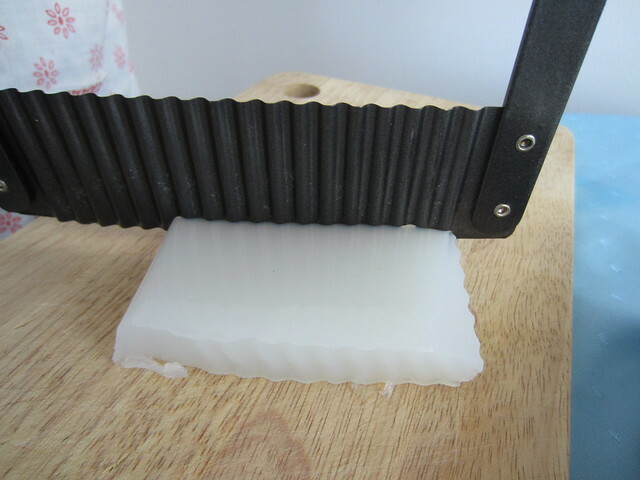 Looks very interesting to make. I'll give it a try. I'm looking forward to walking in the new snow on the sand prairie by our home in MN. Would love to try this! 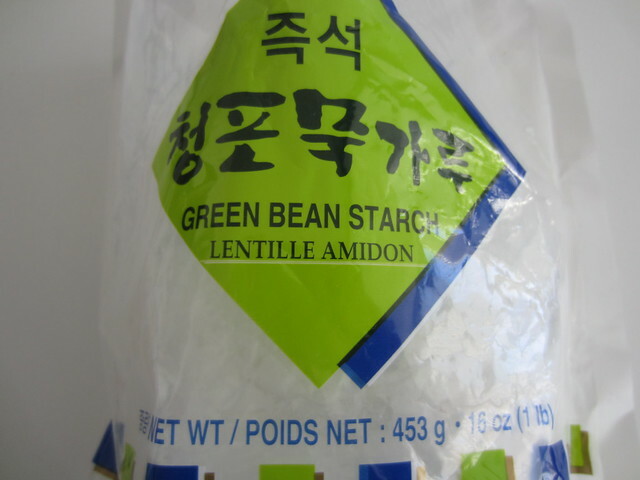 We are going to meet our special friends today for fish and chips and hopefully there is a Korean store where I can buy this Green Bean powder. I am anxious to try it and hopefully I am luck enough to win the draw with you for a free pkg. Anyhow, am definitely going to find a way to make this! 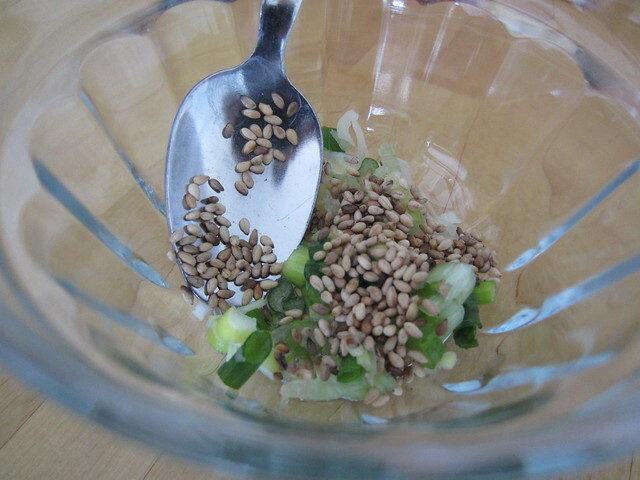 I agree that it would make an ideal side dish to rice and other asian recipes. Thanks for your great newsletters - I love to receive them! Dr Kim, I live in White River Junction, VT, and I really enjoy the fruit of your efforts to be so clear w/ exercises, and recipes w/ great direction and photos. I'm looking forward to the wet snow we have melting! I'm told that will happen today. Otherwise it will freeze and be glare ice. Not so good. Also looking forward to doing some artwork this afternoon, and hoping the fire in the stove I've started, will take and be able to do that soon. My brother has also found your newsletter, and we both enjoy it. Looking forward to retiring next year!! Looks like a pretty cool side dish for most meals. Will try this one soon! Love receiving your email letters. The info is always so great. I've been a fan for many years now. Thanks so much! I live in Woodbridge Ontario and looking forward to my brothers graudation party this weekend. I am from Queen Creek, AZ. Here in Hatch, it has been chilly, so I've been eating a lot of spicy foods, to keep warm from the inside. I have acorn powder in my pantry, so what I'm really looking forward to in the next few days is trying this Korean Jello. It sounds wonderful! Wow, I'd never heard of unsweetened jello. It looks very tasty. We have a nice Korean community here in the Dallas Fort Worth area. Hopefully, I will be able to find the ingredients. I look forward to trying this recipe soon. Thank you for sharing and including photos. Before trying it, can anyone tell me what it tastes like? I am not experienced with Korean food...sorry. I'm looking forward to the weekend and decluttering my apartment. That looks REALLY good! I didn't know acorns were edible, and never heard of acorn powder. Unfortunately we live in the middle of nowhere, and there is no Korean grocery anywhere near us. But I bet it would be available on Amazon! Thanks for the picture recipes you do! 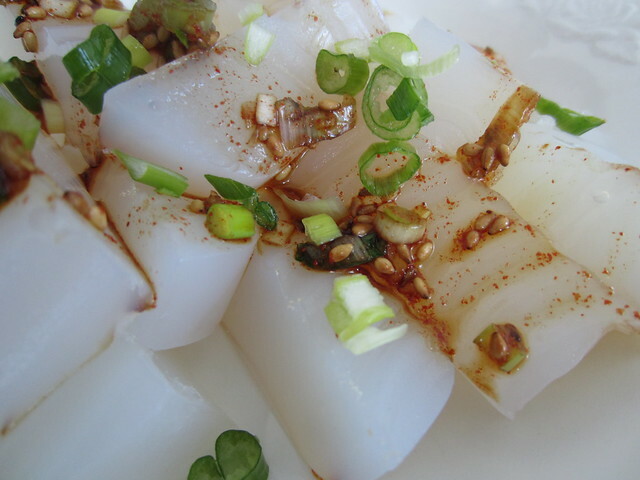 This is one of my favorite Korean side dishes. I look forward to getting over the flu so I can go and get some at Hon's Korean Restaurant in Jacksonville, FL... the best Korean restaurant around. Bethel Park, Pennsylvania. Looking forward to watching Christopher Walken as Captain Hook in Peter Pan. Looks like a great recipe to try! For the giveaway entry: I'm in Lovettsville, VA and I'm looking forward to swimming with some of my best friends on my college swim team these next few days. Love this but have never made it! Looking forward to Korean BBQ for dinner tomorrow night! I'm looking forward to having dinner with a very lovely 90-something-year-old lady in my church Friday night. She's probably cooking herself and there will be a few other ladies there also. She's a most remarkable lady. I am in Minneapolis, MN and am looking forward to going out with my friend for a weekend breakfast for my birthday. It shouldn't be too cold, and no snow so travel is easy. We have lots of amazing local places to try, and I look forward trying a new one. I live in a rural Northern Ontario community (Bruce Mines) of under 400. I am looking forward to my daughter's orchestra rehearsal. She is in grade school, and excited to play in this month's special performance. This recipe looks fabulous! Even my roommate is considering trying it out. For the contest, I'm just a wee bit North of you in Sudbury, ON. I live in Duarte and my wish for the next few days is that my daughter will heal and be free from pain. She has had a long time of illness with cancer. I'm looking forward to spending timeChristmas shopping with my daughters and grandkids tomorrow! Dr. Kim, I enjoyed your story so much that I summoned a friend and read the whole article aloud, I love to hear stories of people of character, of integrity, of human dignity, it is so rare to find in the world, and I applaud your courage to make decisions in life that lead to love and meaningful relationships, rather than focusing on gain and profit. As we age, we find that when we were young we often made mistakes because we didn't understand the value of family and relationships, we lacked the maturity at times to appreciate the things that are more valuable than what we thought at the time. I love the Little Prince's quote in the book, when he said “And now here is my secret, a very simple secret: It is only with the heart that one can see rightly; what is essential is invisible to the eye.” (Antoine de Saint-Exupéry, The Little Prince). Thank you, Dr. Kim, for sharing this heart-warming story. I am a regular reader of your Newsletter. I'm looking forward to trying these recipes/suggestions in the next few days. Move over Turkey dishes, hello Korean Jello! Thank you! this looks like something I would like to try at home. Thanks Dr. Ben. Manitowoc, WI is where I live , but looking forward to heading home on Sunday to celebrate a late Thanksgiving with my family. This recipe sounds great. I currently make gummies with puréed fruit and beef gelatin. But this will be great for a dinner side. Thanks again for all your great recipes...we love them, children and all! First, your article was extremely useful to me because I love much Asian food that I have tried. Usually, Korean is too spicy for me! But the other day I bought some of those large, rice dough balls filled with red bean paste. Yumm (yes, I have a sweet tooth but would love to get rid of it). Second, not so much in the next few days, but over the holidays I am going to Oregon to visit my parents, along with my son. I am really looking forward to spending time with them. Living in sunny/rainy Seattle. Looking forward to the warmth of friends at our dinner party, just one more week at school and two at work before a little rest. Hope to make jello on my break.